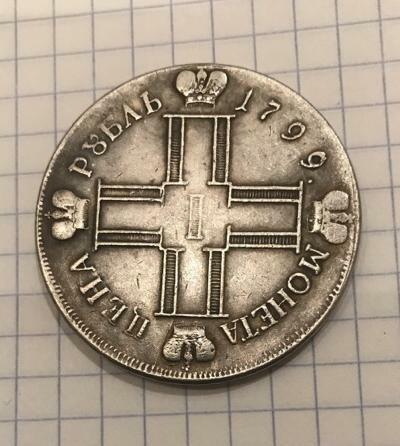 1798, Russia, Emperor Paul I. 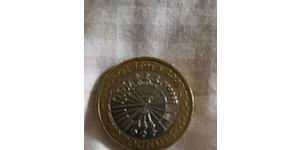 Large Silver Cruciform Rouble Coin. R! Reference: Davenport 1688, KM-101v ($180 in F / $375 in VF). R! 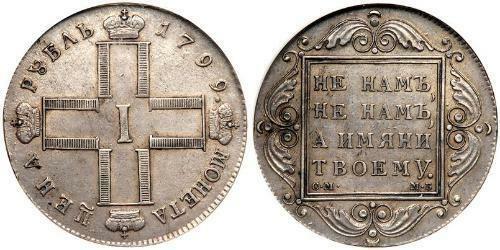 Obverse: Crowned cruciform monogram of four cyrillic P letters around denomination numeral (I). Reverse: Four-line inscription within square. Floral ornamentation in outer fields. Legend: &quot;NE NAM, NE NAM, A IMENI, TVOEMU.&quot; - &quot;Not Unto Us, Not Unto Us, But in Thy Name.&quot;. Comment: Mint initials (C.M.) and mint master&acute;s initials (M.Б.) below. Paul (Russian: Па́вел I Петро́вич; Pavel Petrovich) (1 October [O.S. 20 September] 1754 – 23 March [O.S. 11 March] 1801) was the Emperor of Russia between 1796 and 1801. Paul was born in the Palace of Empress Elisabeth in St Petersburg. He was the son of Elizabeth’s heir, her nephew, the Grand Duke Peter, later Emperor Peter III, and his wife, the Grand Duchess Catherine, later Empress Catherine II. In her memoirs, Catherine strongly implies that Paul’s father was not Peter, but one of her lovers, Sergei Saltykov. Supporters of Catherine’s claim assume that Peter III was sterile, and was unable to even engage in normal sexual relations with her until he had a surgical operation performed, and so could not have sired the boy himself. Although the story was much aired by Paul’s enemies, it is fairly likely that this was simply an attempt to cast doubt on Paul’s right to the throne, in order to prop up Catherine’s own somewhat shaky claim. He physically resembled the Grand Duke so one might doubt the claims of illegitimacy. During his infancy, Paul was taken from the care of his mother by the Empress Elizabeth, whose ill-judged fondness allegedly injured his health. As a boy, he was reported to be intelligent and good-looking. His pugnosed facial features in later life are attributed to an attack of typhus, from which he suffered in 1771. It has been asserted that his mother hated him, and was only restrained from putting him to death while he was still a boy by the fear of what the consequences of another palace crime might be to herself. Lord Buckinghamshire, the British Ambassador at her court, expressed this opinion as early as 1764. However, others suggest that the Empress, who was usually very fond of children, treated Paul with kindness. He was put in the charge of a trustworthy governor, Nikita Ivanovich Panin, and of competent tutors. Her dissolute court provided a bad home for a boy destined to become the sovereign, but Catherine took great trouble to arrange his first marriage with Wilhelmina Louisa (who acquired the Russian name &quot;Natalia Alexeievna&quot;), one of the daughters of Ludwig IX, Landgrave of Hesse-Darmstadt, in 1773, and allowed him to attend the Council in order that he might be trained for his work as Emperor. His tutor, Poroshin, complained of him that he was &quot;always in a hurry,&quot; acting and speaking without reflection. After his first wife died in childbirth, his mother arranged another marriage on 7 October 1776, with the beautiful Sophia Dorothea of W&uuml;rttemberg, given the new name Maria Feodorovna. At this time he began to be involved in intrigues. He believed he was the target of assassination. He also suspected his mother of intending to kill him, and once openly accused her of causing broken glass to be mingled with his food. Yet, though his mother removed him from the council and began to keep him at a distance, her actions can not be termed unkind. The use made of his name by the rebel Pugachev, who had impersonated his father Peter, tended no doubt to render Paul’s position more difficult. On the birth of his first child in 1777 the Empress gave him an estate, Pavlovsk. Paul and his wife gained leave to travel through western Europe in 1781–1782. In 1783 the Empress granted him another estate at Gatchina, where he was allowed to maintain a brigade of soldiers whom he drilled on the Prussian model, still an unpopular stance at the time. Paul became emperor after Catherine suffered a stroke on 5 November 1796, and died in bed without having regained consciousness. His first action was to inquire about and, if possible, to destroy her testament, as it was rumoured that she had expressed wishes to exclude Paul from succession and to leave the throne to Alexander, her eldest grandson. These fears probably contributed to Paul’s promulgation of the Pauline Laws, which established the strict principle of primogeniture in the House of Romanov and were not to be modified by his successors. The army, then poised to attack Persia in accordance with Catherine’s last design, was recalled to the capital within one month of Paul’s ascension. His father Peter was reburied with great pomp at the royal sepulchre in the Peter and Paul Cathedral. To the rumour of his illegitimacy Paul responded by parading his descent from Peter the Great. The inscription on the monument to the first Emperor of Russia erected in Paul’s time near the St. Michael’s Castle reads in Russian &quot;To the Great-Grandfather from the Great-Grandson&quot;, a subtle but obvious allusion to the Latin &quot;PETRO PRIMO CATHERINA SECUNDA&quot;, the dedication by Catherine on the ‘Bronze Horseman’, the most famous statue of Peter in St Petersburg. 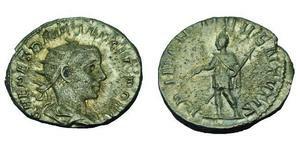 Emperor Paul was idealistic and capable of great generosity, but he was also mercurial and capable of vindictiveness. Both qualities, it must be added, which the Russian people greatly favoured as typical of benevolent autocrats of the time. During the first year of his reign, Paul emphatically reversed many of the harsh policies of his mother. Although he accused many of Jacobinism, he allowed Catherine’s best known critic, Radishchev, to return from Siberian exile. Along with Radishchev, he liberated Novikov from the fortress of Shlisselburg, and also Tadeusz Kościuszko, yet both liberated persons were kept in their own estates under police supervision. He viewed the Russian nobility as decadent and corrupt, and was determined to transform them into a disciplined, principled, loyal caste resembling a medieval chivalric order. To those few who conformed to his view of a modern-day knight (e.g., his favourites Kutusov, Arakcheyev, Rostopchin) he granted more serfs during five years of his reign than his mother had presented to her lovers during thirty-four years of her own. Those who did not share his chivalric views were dismissed or lost their places at court: seven field marshals and 333 generals fell into this category. In accordance with his chivalric ideals, Paul was elected as the Grand Master of the Knights Hospitaller, to whom he gave shelter following their ejection from Malta by Napoleon. His leadership resulted in the establishment of the Russian tradition of the Knights Hospitaller (Order of St John/Maltese Order) within the Imperial Orders of Russia. At a great expense, he built three castles in or around the Russian capital. Much was made of his courtly love affair with Anna Lopukhina, but the relationship seems to have been platonic and was barely more than another detail in his ideal of chivalric manhood. Emperor Paul also ordered the bones of Grigory Potyomkin, one of his mother’s lovers, dug out of their grave and scattered. Paul’s independent conduct of the foreign affairs plunged the country into the War of the Second Coalition against France in 1798, when he sent Suvorov to batter Napoleon in Switzerland and Ushakov to assist Nelson’s operations in the Mediterranean. After great hardships endured and great victories won in either campaign, the emperor suddenly changed his mind and turned toward armed neutrality against the United Kingdom of Great Britain and Ireland in 1801. In both cases it seems as if he acted on personal pique, quarrelling with France because he took a &quot;sentimental&quot; interest in the Hospitallers, and then with Britain after it had captured Malta, their traditional home. Besides the previously abandoned plans of a joint Russo-French naval assault on the United Kingdom, another of his famous follies was the dispatching of the Cossack expeditionary force to fight the British in India (see Indian March of Paul). Paul’s premonitions of assassination were well-founded. His attempts to force the nobility to adopt a code of chivalry alienated many of his trusted advisors. The Emperor also discovered outrageous machinations and corruption in the Russian treasury. Although he repealed Catherine’s law which allowed the corporal punishment of the free classes and directed reforms which resulted in greater rights for the peasantry, and better treatment for serfs on agricultural estates, most of his policies were viewed as a great annoyance to the noble class and induced his enemies to work out a plan of action. A conspiracy was organized, some months before it was executed, by Counts Petr Alekseevich Pahlen, Nikita Petrovich Panin, and the half-Spanish, half-Neapolitan adventurer Admiral Ribas. The death of Ribas delayed the execution. On the night of the 23 March [O.S. 11 March] 1801, Paul was murdered in his bedroom in the newly built St Michael’s Castle by a band of dismissed officers headed by General Bennigsen, a Hanoverian in the Russian service, and General Yashvil, a Georgian. They charged into his bedroom, flushed with drink after supping together, and found Paul hiding behind some drapes in the corner. The conspirators pulled him out, forced him to the table, and tried to compel him to sign his abdication. Paul offered some resistance, and one of the assassins struck him with a sword, after which he was strangled and trampled to death. He was succeeded by his son, the 23-year-old Alexander I; who was actually in the palace, and to whom General Nicholas Zubov, one of the assassins, announced his accession, accompanied by the admonition, &quot;Time to grow up! Go and rule!&quot;.